Viburnum plants (Viburnum spp.) are relished by gardeners who appreciate a relatively low-maintenance ornamental shrub that provides spring flowers and attractive fall fruits and foliage color. More than 150 species of viburnum exist, with even more cultivars. They are planted in woodland gardens or mixed shrub borders in any fertile soil that is well-drained. Full sun to partial shade exposures suffice, depending on the plant species. A viburnum species can be grown in any of U.S. Department of Agriculture hardiness zones 3 through 11. Viburnums, like any other plant, need supplies of nitrogen, phosphorus and potassium. Trace micronutrients like iron or manganese are needed in small amounts, too, to facilitate various metabolic processes. According to Dr. Michael Dirr, author of "Viburnums," viburnum shrubs grow well on a relatively restricted fertilization regimen; most species prosper even in the most mundane garden conditions. Dirr tends to maintain his own collection of viburnums by applying fertilizer in late winter. If the plant is not growing at least 6 inches in twig length annually, he tends to employ the use of fertilizer to promote the best growth rates. A secondary fertilization is occasionally undertaken after the viburnum shrub finishes its flowering. Any general purpose, well-balanced landscape fertilizer suffices when fertilizing viburnums. Dirr tends to favor granular slow-release fertilizer products, such as those rated 10-10-10 with micronutrients. 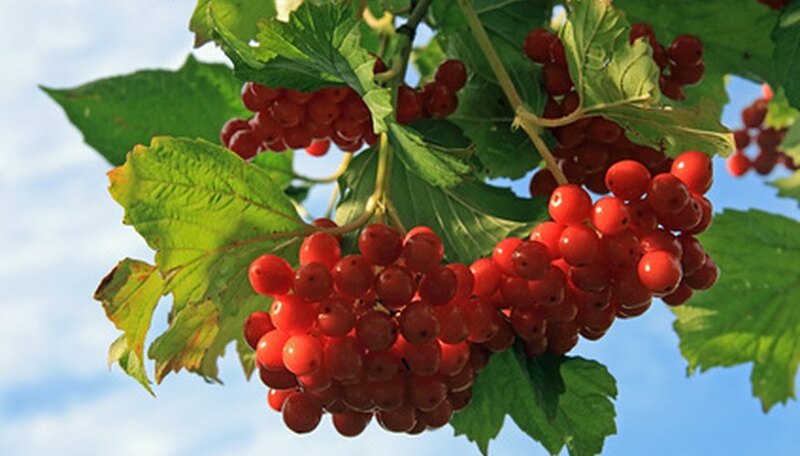 Follow product label directions for appropriate dosage for the size of viburnum plant being treated. If a secondary fertilization occurs after flowering, the dosage is one-half the recommended rate. Dirr strongly states you must never overfertilize. Granular slow-release fertilizers work well when dealing with viburnums, but water-soluble types are also suitable. Specialty brands or formulas marketed as "growth or bloom booster" are fine, according to Dirr, as long as they are well-balanced with equal parts of nitrogen, phosphorus and potassium and provide some micronutrients. Soils enriched and constantly maintained with organic mulches and manures have diminished need for synthetic fertilizer products, according to Dirr. While organic matter may not supply all nutrients in the optimal levels, the decomposing materials improve the texture, tilth and moisture-retention of garden soils. Conduct a soil test to learn exactly which soil nutrients are abundant or lacking in your garden. In viburnum shrubs that heavily produce fruit clusters consistently, a nitrogen deficiency can occur in the leaves at branch tips nearest the developing berries. Dirr comments this is most prevalent in species Viburnum lantana, Viburnum rhytidophyllum and Viburnum x rhytidophylloides. Such plants greatly benefit from that secondary half-rate fertilizer application in summer after the flowering display wanes and fruits become noticeable.